The Election Commission (EC) on Tuesday directed probe agencies under the department of revenue to “come down heavily” on those who use black money and illegal inducements to vitiate the poll process. The EC also asked the Central Board of Direct Taxes (CBDT) to furnish a full report by Wednesday on the recent raids on close aides of Madhya Pradesh Chief Minister Kamal Nath and others in four states. Union Revenue Secretary A B Pandey and CBDT Chairman P C Mody met Chief Election Commissioner Sunil Arora and Election Commissioners Ashok Lavasa and Sushil Chandra on Tuesday, two days after the election panel "strongly advised" the department that action by enforcement agencies under its command should be "neutral" and "non-discriminatory" during the polls. Official sources said the two officials briefed the EC on intelligence inputs it was receiving during the election season and the mechanism to execute surprise checks and raids in case the inputs were “credible”. 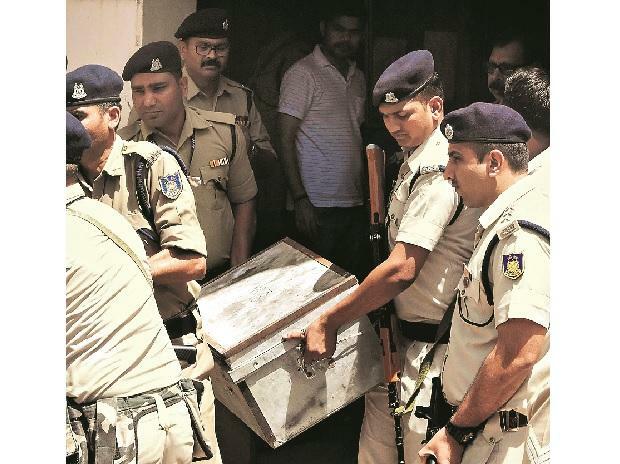 A similar input was received by the Delhi investigation wing about "large-scale collection, possession and movement of unaccounted assets" from Madhya Pradesh to Delhi, and hence the raids happened, they told the EC. They also told the EC that they could pass on any information on such raids only after the findings were substantiated. Pandey in a letter to the EC urged it to advise its officers to take immediate enforcement action at their end under the election and other appropriate laws if they came across any specific information about the use of illicit money in electoral processes. He said this would help check and eventually eliminate the use of unaccounted money in elections. “They may also, if deemed fit, pass on the information confidentially to the income-tax department for taking further necessary action,” he added. It is likely that the tax department will, in the coming days, slap criminal charges for possessing illegal foreign assets and benami properties against the accused based on the documents found during the raids. As voluminous data, in the form of papers, diaries and hard drives, has been seized and is being processed, the CBDT is taking time to present a full report of the operation, they said. The I-T department has also grilled a few people and is sending summons to a number of them to depose so that the probe in the case can be taken forward. It is understood that the department wants to also grill S M Moin, an employee of senior Congress leader Ahmed Patel, after his premises in Delhi's Geeta Colony was searched over the past few days. Patel had visited Moin's house when I-T sleuths were present. Sources in the tax department said they have seized hand-written and printed "records of funds collection and distribution" which they suspect were allegedly sourced illegally from government funds.